hat a difference a new generation and a responsive market can make. Younger, highly-trained and talented winemakers have played their part in transforming quality in this the most complex and magical of France’s wine regions. No stronger argument can be made for the validity of terroir than in Burgundy, where subtle differences of climate, soil composition and aspect identified over the course of centuries and expressed in individual climats make this region so complex and fascinating. Red Burgundy should enthrall with its perfume, complexity, finesse and textural qualities rather than power, oak and out-and-out concentration. White Burgundy should express complexity in both aroma and flavour, be it more minerally or buttery and nutty, and have a depth, structure and balance proportionate to its origins. Both should be more than just the most noble expression of two grapes, now familiar the world over, Pinot Noir and Chardonnay. In the Côte d’Or, Burgundy’s heart, the fragmentation of the vineyard area is extreme, and a complete contrast to Bordeaux’s more coherent, larger patchwork. With a few rows here and a few there and the difficulties of vinifying such small quantities of grapes, it made sense to sell to a négociant as almost all growers did in the early 20th century. The cost in terms of quality has been well documented but through buying, trading and marriage a host of new independent growers have provided much of the impetus for higher quality. Yet as recently as 20 years ago Burgundy was in dire straits. Excessive use of potassium and other chemicals on the soils (especially in the Côte de Nuits) led to reduced natural acidity levels and the dependence on pesticides, in turn leading to generally debilitated vineyard health. The resulting grapes were low in both sugar and acidity. Many producers considered it necessary to both overchaptalize and acidify, a dual-pronged desperation made illegal in 1987. Whilst one practice or the other may be employed within strict limits there is little doubt that some producers still continue to do both despite some high-profile prosecutions by the authorities. Others, though, have sought to restore the health of their vineyards and obtain grapes of high quality and a new order of producers has emerged, better qualified but more often than not getting back to basics. They have improved the soil and plant health and consequently that of the grapes and wines. A movement towards organic and biodynamic viticulture has been stronger here than probably anywhere else in the wine-producing world. Currently many top estates take the advice of soil scientist Claude Bourguignon to enhance further the quality of their soils. Another consequence of the Burgundy’s weak constitution was a tendency towards excessive fining and filtration in order to ensure the wine’s stability. Better fruit quality as well as widely expressed criticism of heavy reliance on these practices, mean this trend has been reversed. Lower yields have been advocated too with much debate about how they should be achieved; whether through winter pruning, increasing vine densities, the use of different rootstocks or green harvesting. The best wines are now cleaner, riper and much more consistent even in more difficult years – though in the 1990s nature seems to have rewarded the many varied efforts – yet the wines are far from standardised. And even though there has been a general trend to ever bigger, oakier and more concentrated wines, at least some succeed admirably in retaining balance without losing the stamp of terroir. Where there were pockets of quality and occasional bright spots in some of the larger appellations now there are many producers turning out consistently high-quality wines. Yet from too many of the big merchants or négociants the wines continue to be very mediocre and it is why so many of them are missing from the following producer profiles. The ones included are the exception and in some instances are very good indeed. Much of the best wine comes from the smaller growers but an increasing number now also buy in some grapes. The basic hierarchy in the Côte d’Or is of grands crus at the top, followed by premiers crus – always associated with one of 25 villages (premiers crus are often blended together due to fragmentation, so labelled simply Premier Cru) – then the level of the village itself (e.g. Gevrey-Chambertin) before the sub-regional appellations (such as Côte de Nuits-Villages) and finally the regional generics: Bourgogne Rouge (Pinot Noir), Bourgogne Blanc (Chardonnay) and Bourgogne Aligoté. The lowest level is not necessarily the humblest, however, as wine from any level may be sold as a generic (for instance, recently replanted vines that have only just come into production or vines that lie just outside a classified area). It is also worth noting that premier cru wine may also be included in part of a village-level bottling. This may be due to insufficient quantities for a separate bottling or a grower’s decision not to compromise the integrity of his premier cru when faced with unsatisfactory quality in a difficult vintage. Also important to understanding the appellation system in Burgundy is the concept of climat or individual vineyard areas. Occasionally only part of a named area may be designated premier cru (e.g Chambolle-Musigny la Combe d’Orveaux) while within the unclassified village areas (which may be large, as in Meursault) the named vineyards (lieux-dits) may be added to the label (e.g. Meursault Tillets). The best of these will be close to premier cru level, just as several premiers crus are comparable to some of the less well-defined grands crus. Note too that the spelling of a particular vineyard can vary slightly from one producer to another. What follows is a brief breakdown of the most important villages and their most important crus. Production from the more northerly Côte de Nuits is almost exclusively red. Marsannay and Fixin at the north end of the Côte de Nuits, begin the band of mostly east-facing hills that stretches, with twists and breaks, until Santenay and Maranges in the tail of the Côte de Beaune. Marsannay tends to be light but scented and produces, unusually for the Côte de Nuits, a significant amount of rosé and white. Fixin in contrast, produces quite forceful, earthy Burgundy, including some powerful reds from premiers crus on slopes above the village. The wine, like that from the southern end of the Côte de Nuits, can be sold as Côte de Nuits-Villages. After the briefest of interludes (around Brochon) begins Burgundy’s great rich seam of red. Gevrey-Chambertin has 26 premiers crus including the outstanding Clos Saint-Jacques (grand cru in all but name) and Les Cazetiers at the centre of an arc of premiers crus on slopes to the east of the town. South of the village itself begins the great chain of grands crus that run almost to the southern edge of Vosne-Romanée. Of the nine in Gevrey, the 12.9 ha Chambertin and 15 ha Clos-de-Bèze are easily the most important. Seven others all append the name Chambertin: Mazis-Chambertin and Ruchottes-Chambertin are arguably the next best in potential; Griottes-Chambertin, Charmes-Chambertin (under which much of Mazoyères-Chambertin is sold) and Chapelle-Chambertin are also capable of greatness; the last, Latricières-Chambertin, rarely reaches the quality of the best premiers crus. Gevrey at any level should be distinguished by its greater power, concentration and structure than its neighbouring communes. Despite a radical improvement, too much of it remains pretty poor. Morey-Saint-Denis undeservedly lacks the lustre of Gevrey and Chambolle, but can combine the muscle of the former with the elegance of the latter, though which prevails to the greater degree depends as much on the grower as the on vineyard site. A tiny amount of white is made here too. While significantly smaller than Gevrey, it still boasts 20 premiers crus and four grands crus – Clos de la Roche (17 ha), Clos Saint-Denis (6.6 ha), Clos des Lambrays (8.8 ha) and Clos de Tart (7.5 ha) – as well as a thin slice of the 15 ha Bonnes Mares which falls mostly in Chambolle-Musigny. Bonnes Mares, with its mixed soils, is of variable style but is usually sturdier when sourced from the Morey end of the vineyards. Then the chain of grands crus is broken, before continuing with Le Musigny (10.7 ha) at the southern end of the commune. 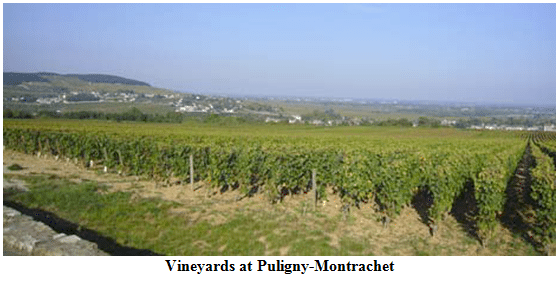 Some fine premier cru vineyards lie between the two, including Cras, Fuées and Baudes, but closest in style and proximity to Musigny are the often superb Amoureuses and Charmes. Musigny, like no other cru, can express the sumptuous elegant beauty of red Burgundy. The commune of Vougeot is dominated by the massive 50 ha grand cru of Clos Vougeot. Though continuous and walled-in, in its lower, flatter reaches it juts deep into what corresponds to only village-quality land in neighbouring Vosne-Romanée. Arguably it ought to be partitioned into three different levels. Without due care you may find you have paid a grand cru price for what is, in effect, only village-level wine, although your choice of grower among the 80 owners of the vineyard counts for as much as the position of the vines. At its highest it adjoins both Musigny and Grands Echezeaux and at its best it is full, rich and complex if less aristocratic than the former. Both of the grands crus Echezeaux and Grands Echezeaux (with 32 ha and 9 ha respectively in production) fall in the commune of Flagey-Echezeaux. At their best both produce sturdy, characterful Burgundy, though much of Echezeaux lacks the class expected in a grand cru. Neighbouring Vosne-Romanée is a commune like no other in the Côte de Nuits. Behind the village lie the great vineyards that produce Burgundy’s most expensive and sought-after wines. At the heart of 27 ha of grands crus are La Romanée (0.85 ha) and Romanée-Conti (1.8 ha) with Richebourg (8 ha) to the north, Romanée-Saint-Vivant (9.4 ha) closer to the village, and La Grande Rue (1.65 ha) and La Tâche (6.1 ha) to the south. These in turn are flanked by some marvellous premiers crus including Malconsorts, Chaumes and Clos des Réas on the southern edge of the commune with Nuits-Saint-Georges; with Brûlées, Suchots and Beaux Monts on the northern side, the latter two pressing up against Echezeaux. The best of these are rich, intense and concentrated but with varying degrees of finesse, opulence or silkiness, dependent as much on producer as location. Village-level Vosne comes from east of the village. The last major village in the Côtes de Nuits is Nuits-Saint-Georges though vineyards continue on south to Comblanchien. Here, the best wines offer power and intensity as well as a degree of finesse in the best of 38 premiers crus (which extend into the more southerly commune of Prémeaux). Damodes, Boudots and Murgers are some of the best between Nuits-Saint-Georges (the town) and Vosne-Romanée; Vaucrains, Pruliers and Les Saint-Georges are the most notable to the south of Nuits. There are no grand crus. Lesser wine can be flavoursome if chunky but the worst is rough and dilute. The cooler hinterland of the Côte de Nuits contains pockets of vineyards in favourable sites which constitute the Hautes-Côtes de Nuits. South of the town of Beaune is the equivalent Hautes-Côtes de Beaune. A significant amount of the wine is made by the co-op Les Caves des Hautes-Côtes; these wines or an example from a top grower can be good in an exceptional vintage. The Côte de Beaune’s reputation is more for white than red yet the majority of wines are in fact red. From here south the gradients are lower and the swathe of vineyards wider, occasionally receding into the hills behind the main slopes. 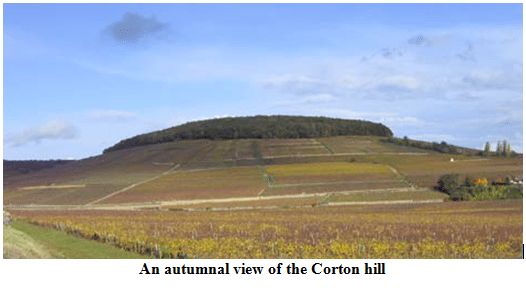 It begins in a cluster of villages around the famous hill of Corton. The humble AC of Ladoix (with seven premiers crus) is not widely seen and some of thewine is sold under the sub-regional appellation of Côte de Beaune-Villages. Wine for the latter can also come from another 15 villages, making it much more important than the Nuits equivalent. Aloxe-Corton at the foot of the Corton hill includes the famous appellations of Corton and Corton-Charlemagne, though vineyards spill into adjoining Ladoix and Pernand-Vergelesses. Most of the white from Burgundy’s largest grand cru is sold as Corton-Charlemagne (51 ha) and most of the red as Corton (98 ha), though there is a little white Corton too (2.5 ha). The trend to planting Chardonnay begun in the mid-19th century continues, the paler soils at the top of the hill being the best site. Great Corton-Charlemagne is full-bodied but slow-developing due to a powerful structure and requires patience. Red Corton (which oftens attaches one of several lieu-dit names) can be similarly austere when young but develops a richness and a distinctive minerally elegance with age. Aloxe-Corton AC, almost entirely red, includes 13 premiers crus which lie directly below the red Corton vineyards. To the west of the Aloxe-Corton commune lies Pernand-Vergelesses, some of it tucked into the folds in the hills. Increasingly good red and white is made under the AC. The best premier cru, Ile des Vergelesses, favours reds of finesse rather than power but they add weight with age. To the south, it adjoins Savigny-lès-Beaune, which extends east up a little valley to the village itself. The best vineyards lie on both sides, the more northern band of premiers crus (including Guettes, Serpentières and Lavières) are more elegant than those from the southern band (including Dominodes, Marconnets, Narbantons and Peuillets), which tend to be fuller and firmer. Importantly, this is a reasonably plentiful source of good-value Burgundy. Rarely exciting is wine from Chorey-lès-Beaune, from flat land to the east of the Savigny AC. Beaune, historically and commercially, is the heart of Burgundy but it is also one of the three leading Côte de Beaune red wine villages and includes some excellent premiers crus from the gentle slopes west of the town. Due to diverse soil types, leading premiers crus vary from the full and firm to softer, more elegant wines. Marconnets, Fèves and Bressandes are of the first category, Grèves and Teurons are richer and softer, Clos des Mouches full but elegant too. Important vineyard owners such as Jadot, Albert Morot, Bouchard Père and Drouhin all provide the opportunity to compare and contrast some of the best crus from a single source. Another major vineyard owner, and one of the most important in the Côte de Beaune, is the Hospices de Beaune, their many (often oaky) cuvées (unique blends of predominantly premiers crus named for their benefactor) are sold at the famous auction in November. The wines are then ‘finished’ by the purchasing négociant, a factor that has a further bearing on their (variable) quality. The rarely seen Côte de Beaune AC is for a few vineyards in the hills behind Beaune AC. Pommard is a continuation of Beaune and its reputation for sturdy, full-bodied reds is in part due to more clayey, often iron-rich, soils than its neighbours. Grands Epenots and Rugiens Bas are the finest premiers crus. In Volnay the soils are lighter and poorer, contributing to the wine’s refinement and elegance. Most of the best premiers crus come from south of the village, including Taillepieds, Clos des Chênes, Caillerets Dessus and Santenots. Santenots actually lies within the adjacent Meursault but is generally sold as Volnay when made from Pinot Noir, and as Meursault if from Chardonnay. South and west of Volnay an ascending flank of vineyards extends into the hills and includes the villages of Monthelie, Auxey-Duresses and Saint-Romain. The first two can provide excellent reds from several premiers crus but also a little good village white, especially in Auxey-Duresses. Good Saint-Romain white can be better than its position in the Hautes-Côtes de Beaune hills might suggest. Meursault is one of the three biggest communes in the Côte d’Or and is the most important white wine village. But as with Beaune or Gevrey-Chambertin, with size comes variability. At its worst it is heavy and characterless but good examples are full, ripe and fruit-rich. The finest are intense, stylish and in the case of the would-be grand cru, Perrières, minerally and refined. There are no grands crus but other fine premiers crus include the best examples of Genevrières, Charmes, Poruzots and Goutte d’Or. Village lieux-dits names of note include Chevalières, Grands Charrons, Narvaux, Tessons and Tillets. Blagny is a small red wine outpost nestled against Meursault and Puligny-Montrachet. ‘Puligny’ and ‘world’s best’ often share the same sentence and with good reason. The village includes the grands crus Chevalier-Montrachet (7.36 ha), Bienvenues-Bâtard-Montrachet (3.69 ha) and half of the 8 ha Le Montrachet and 6 ha of the 11.87 ha Bâtard-Montrachet. Le Montrachet is the greatest, and most expensive, of all but is a wine capable of marvellous concentration, sublime proportions and exquisite complexity. Chevalier-Montrachet, from thinner soils above, is potentially the closest in quality but Bâtard-Montrachet, from flatter vineyards, can offer superb richness and intensity too. There are many outstanding premiers crus which also command high prices. Caillerets (including Les Demoiselles) and Pucelles, adjoining the grands crus, will surpass any grand cru not at its full potential. Clavoillon and Folatières and the more elevated Champ Gain and La Garenne can highlight the Puligny finesse and intensity as can Champ-Canet, Combettes and Referts which extend as far as Meursault’s Perrières and Charmes. As well as the continuation of grands crus Le Montrachet and Bâtard-Montrachet, the village of Chassagne-Montrachet adds the tiny 1.57 ha grand cru of Criots-Bâtard-Montrachet. The wines sold under the Chassagne AC were once predominantly red but its reputation is now emphatically white. Leading premiers crus include Caillerets, Champs Gains, Embrazées, Morgeots, La Romanée and Ruchottes – mostly confined to lighter-coloured soils on the higher slopes. Reds vary from the thin and unripe to full and fleshy and can be a source of good value (they only command around half the price of a white from the same vineyard, thus the trend to white continues). La Boudriotte, Clos Saint-Jean, La Maltroie, Morgeots and Chenevottes are the most noted red premiers crus. Behind Chassagne and Puligny lies the commune of Saint-Aubin. Some remarkably good white is produced by the best growers from the most worthy premier cru vineyards: La Chatenière and those that adjoin Chassagne (Le Charmois) and Puligny (En Remilly and Murgers des Dents de Chien – backing on to the Mont Rachet hill). Reds tend to be relatively light and slightly earthy. Santenay is the Côte de Beaune’s last significant commune for quality as the tail of the vineyard area swings west. From south-facing vineyards red wines dominate, the best of these are both full and stylish. These are likely to come from the premiers crus Gravières, La Comme and Clos des Tavannes that extend to the edge of Chassagne. One or two excellent whites are also being produced. While a fast improving AC with some excellent-value wines, Santenay is not so good from a weaker vintage or from a mediocre producer when the wine may be lean and stalky. To the west the vineyards adjoin Maranges, more earthy and robust than the best Santenay, though exceptions exist. The Chalonnaise is not a continuation of the Côte d’Or but an area of less sheltered rolling hills where the grapes ripen later and the wines are lighter. However as a source of quality and value the best growers can provide a real alternative to lesser villages of the Côte d’Or. Bouzeron, the first of five separate appellations is classified for Aligoté only, its Pinot Noir and Chardonnay sold as Bourgogne Côte Chalonnaise. Rully lies east and south of Bouzeron and makes more white than red – both of which can reveal ripe, attractive fruit in a top example. Less ripe Chardonnay is likely to be made into Crémant de Bourgogne. South of Rully is Mercurey, the region’s most important AC. Most of the wine is a quite structured red, surprisingly rich and intense from a combination of a top year and producer, but hard and lean when not. A little good white is also produced. Slightly more supple yet stylish reds are produced in Givry, where the balance of red and white is similar to that of Mercurey. The southernmost appellation is Montagny, where exclusively white wine is made. The wines can be fuller if sometimes less distinguished than those from Rully.